Happy Friday! I don’t know about you, but I couldn’t be happier to finally reach the weekend. Work stress has made this past week a real struggle, so two days stretched out in front of me (including ring shopping tomorrow – hell to the yeah) with nothing but relaxation and X Factor sounds pretty darn amazing. Do you have an exciting plans for the weekend? As my friends and family know, I grew up being one of those pony-mad teens who would spend every spare minute around horses… completely obsessed. 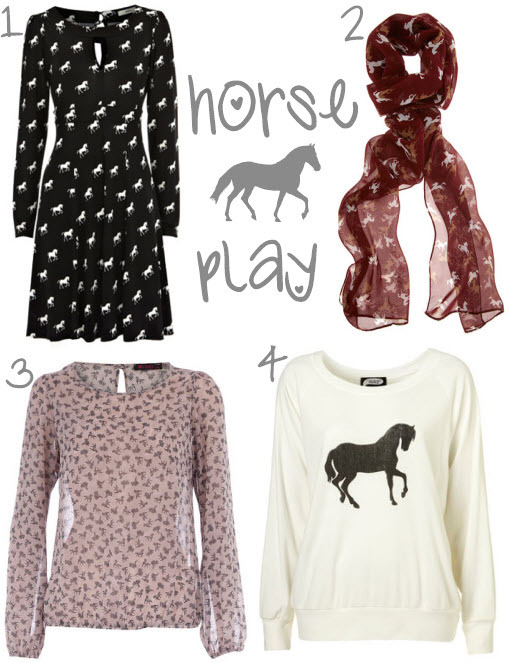 I still love horses, still dream of one day having my own, so the current horse print trend was bound to catch my eye. I especially like the white on black print dress, it’s so striking. I do find it mildly hilarious that my teenage uniform of jodhpurs, tall boots and quilted jacket is now fully en vogue. I couldn’t have been less trendy back then if I’d tried; I think it was partly due to the scraped back greasy hair and penchant for Benetton sweatshirts. It wasn’t a good time for me fashion-wise. Anyway, back to horse motifs… would you don this print?